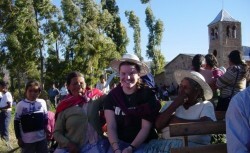 Amizade has maintained partnerships with community organizations in Cochabamba, Bolivia for more than twelve years. Despite its beautiful scenery and perfect climate, Bolivia is one of the poorest countries in all of the Americas and faces a variety of social and economic challenges. During the Amizade program, you’ll have the opportunity to support ongoing school construction projects in cooperation with rural indigenous communities. No prior construction experience is necessary, as Amizade works with local masons who have become adept at working with volunteers.